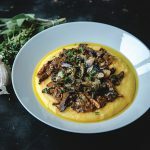 This sumptuous and comforting wild mushroom ragout not only tastes wonderful, it's also packed with wholesome ingredients that are perfect for when you're feeling under the weather. To prepare the tomatoes, score the tops of them with a cross and dunk into a bowl of hot water. Leave for 30 seconds, remove and dunk into a bowl of cold water, leaving for a minute. Using the edge of the crosses, peel the skin away. Quarter the tomatoes and scoop out the seeds. Clean the mushrooms using a pastry brush, keeping the Portobello mushrooms separate. In a wide frying pan, heat 2 tbsp olive oil over a medium-high heat. Sauté the onion until brown and softened. Remove from the pan and set aside. In the same pan, heat another tbsp olive oil and cook the Portobellos until golden in colour. Lower the heat, add the sage, thyme, chilli flakes, tomato purée, tomatoes, rehydrated wild mushrooms (keeping the liquid), salt and pepper, and give everything a stir, cooking for a couple of minutes to allow the flavours to infuse. Add the flour by sprinkling evenly across the pan, stirring for a few minutes to evenly incorporate and cook the flour. Add the onions back in. Pour in half the dried mushroom liquid and keep stirring to encourage the flour to thicken the liquid evenly. Once thickened, gradually add the remaining mushroom liquid in and cook for 2 minutes until the sauce has a gravy-like consistency. Add water to thin the sauce if desired. Taste and adjust the seasoning, it may need a squeeze of lemon juice. The ragout can now be cooled for re-heating later or freezing. Just before serving, heat 2 tbsp olive oil in a frying pan on moderate heat and add the wild mushrooms. Season and sauté for 2 minutes until they begin to colour. Add the garlic and parsley, cook for 1 minute, stirring. Add the mushrooms to the sauce, transfer to a warm serving bowl and serve with warm polenta (as shown) or wild rice and steamed greens. To ensure you make the most of the health benefits of these fresh ingredients, CNM recommends the use of organic ingredients.